Brendan Rodgers has warned his Swansea City play-off heroes there will be "no sentiment" when he plots their Premier League survival strategy. Rodgers watched his Swans beat Reading 4-2 in Monday's final but insists the Welsh side must be strengthened before their next season's campaign. "One of the things I learned from Reading was to never be sentimental again," said Swans boss Rodgers. "I want to give the players here a chance but we also need to strengthen." In his first season in charge at the Liberty Stadium, Rodgers inspired the club to a top-flight return after a 28-year absence and is already drawing up a list of summer transfer targets for chairman Huw Jenkins. Most of the current squad are under contract, with midfielder Darren Pratley, goalkeeper Dorus de Vries and defender Angel Rangel the only ones who featured at Wembley on Monday coming to the end of their deals. Midfielder Ferrie Bodde, who missed the entire season with a knee injury, is also soon to be out of contract, but the club have already announced he has been offered a 12-month extension. 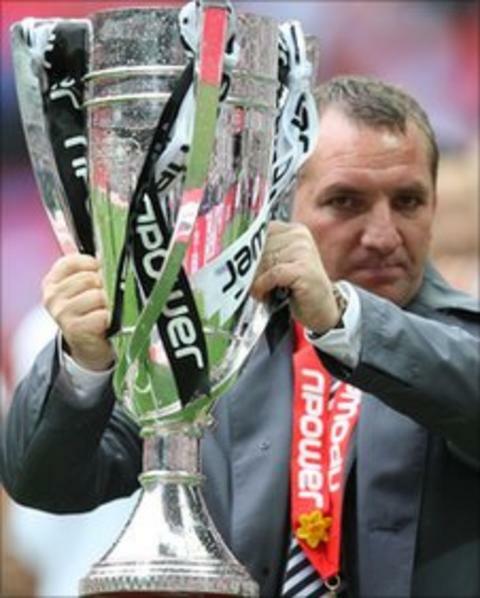 Rodgers knows that 11 of the previous Championship play-off final winners have been relegated in their first Premier League season. And the 38-year-old faces a tough task to prove the bookmakers wrong as the Welsh club are already odds-on favourites for relegation next season. Swansea are renowned for their prudency in the transfer market but Jenkins can now dip into the estimated £90m jackpot the club earned by securing promotion. "If we were underdogs this year and tipped to be in the bottom three, then there is absolutely no question we will be underdogs next year," said Rodgers, who spent two years as reserve team coach at Chelsea. "We have targets that will hopefully allow us to maintain the identity. "We will need to strengthen, absolutely. It can be a big mistake if you get promoted and you try to do it with the same players. "In my experience of working at the bigger clubs and having seen the Premier League for four-and-a-half seasons closely - it's a different stratosphere with regard to pace and power. "I dropped big players this season when I felt it was needed and maybe they expected to play so it is not sentiment. "If the players are to be at the level and think they have a fantastic spirit then I want to give them a chance. "I won't rip up the team, I want to add to it. But there is no doubt, we will need to strengthen. "Players like Leon Britton and Alan Tate deserve the opportunity to be in a Premier League squad. "They were with the club when they were in League Two and now they've come all the way through into the Premier League - and because they are outstanding players. "My fear was, if we didn't win this game, there would be players tempted to go to other Premier League clubs. "I'd like to think now, having got there, we can reward our players for being at a Premier League club. And because they love the team it will be great for them to play for us in the Premier League." Scott Sinclair is Rodgers's biggest Swans signing so far and the £1m acquisition from Chelsea delivered in the final. His hat-trick - taking his season goal tally to 27 - guided his side to a 4-2 triumph over Reading to ensure Wales has its first Premier League team. Swansea were widely hailed as the finest footballing side in the Championship and Rodgers insists their "style with steel" and "possession with penetration" will continue against some of Europe's finest next season. "We will try to play our game in the Premier League," said Rodgers. "But we're going to places like Old Trafford and Stamford Bridge so it will be very, very tough - but it is the way we try to do it. "The final was important as while we needed to win, we had to defend the identity of the team which was to play how we have been playing all season, under pressure and with millions watching around the world as well as the 90,000 in the stadium."